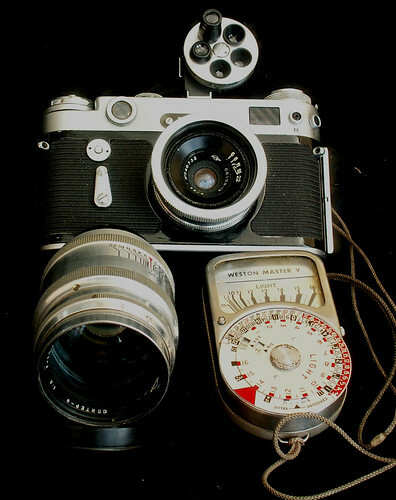 The Zorki 6 is a rangefinder camera produced by the Russian factory KMZ (the makers of the Zenit SLR). This is the sixth camera of course in the produced Zorki lineup, and the last unique model to be created. The Zorki 4K, produced after the 6, is a modification of the 4. The Zorki 6 is nearly identical to the Zorki 5, in terms of size. The Zorki-6 is the only Soviet Leica-based rangefinder built with a hinged back, and fixed takeup spool. The shutter speed/RF mechanism binding problems encountered in some Zorki-5 when their shutters are cocked and fired with out the lens in place has been eliminated. A self-timer was also added. This can be thought of as a loose Leica copy, since it descended from the original Zorki, which was more or less a direct copy of the Leica II. Despite the external differences and modified or new features, it still used the cloth focal plane shutter similar to the one in the Leica II. Shutter speeds are from 1/30th to 1/500th of a second plus B, Unlike most Soviet rangefinders the Zorki-6 and Zorki-5 shutter speeds can be changed before or after cocking. A secondary dial with an index mark is found within the shutter dial, which allows the proper speed to be indexed. As for the 5, the shutter is cocked by a wind lever, which got smoother in the 6, although this varies with models nowadays. Winding is more positive and shutter cocking will be less prone to error if two or more shorter strokes are made, instead of a single long throw stroke. Frames are counted by a rotating counter disc and must be reset manually after inserting each new film. The shutter release is located on the film advance lever, along with the film counter disc. The rewind button is located to the left of the wind lever. This camera is stepped so as to recess the winding lever below the other controls, making it more compact. Strap lugs are also included as on the Zorki 5. There are two flash sync sockets, X and M, and a cold shoe. Vertical adjustment for the rangefinder is done by rotating the optical wedge in left rangefinder fore port. A horizontal adjustment is done by a screw hidden behind the screw holding the left of the nameplate (when looking from the front). Like all other FED or Zorki, rangefinder focus calibration must be done for both infinity and 1 metre settings. The infinity adjustment is done throught the rangefinder adjustment screw concealed by the nameplate. The short distance adjustment is done by altering the slope angle of the rangefinder follower tip. This camera most commonly has the Industar-50, although the Jupiter-8 as well as collapsible Industar-50 were also produced with it as standard lenses. Occasionally, these cameras may be found with Industar 26 or even Industar 61 lenses as a result of some previous user replacing the original lens with these non-Zorki issued lenses. A familiar mechanical self-timer is on the front of the body like other Zorkis and FEDs of its time. The tripod collar is 3/8 in., unlike the standard 1/4 in. for modern 35mm cameras. The nameplate is a separate metal piece screwed onto the front. There are at least three versions of nameplates, the cyrillic, the roman, and the cursive roman, the last being the rarest. On roman models there is a stamp on the back reading Made in USSR, and the Russian equivalent on cyrillic models, and on some models there is no inscription. The KMZ logo is also stamped on the back, along with the serial number from whose first two digits the year of manufacture can be deduced. Produced between the years of 1959 and 1966.